Perfect for coloured hair, Moroccanoil Moisture Repair Conditioner repairs hair that has been weakened by dyes, chemical processing and heat styling. It provides intense conditioning and hydrating, leaving your hair feeling soft, manageable and easy to comb. Rich in nourishing ingredients such as argan oil, keratin and fatty acids, the sulphate-free formula coats each strand to improve your hair's health. It won't strip away colour either, so your hair stays looking vibrant. After shampooing, squeeze excess water and apply from mid-length to ends. 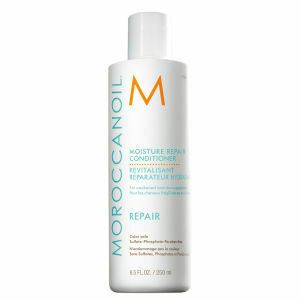 Moroccanoil Moisture Repair Conditioner is a must have!